Burj Al Arab is the icon of Dubai; shaped like a sail it is visible in Dubai’s sky line almost anywhere you look from. Stood in its own island and only accessible by a small causeway, the exclusivity of his hotel is apparent from the drive. Whether landing on the Helipad or driving up to the hotel, the hotel leaves guests stunned and often lost for words. As guests enter the hotel, embellishments, vibrant colours and the grandiosity of the hotel is apparent. Exceeding expectation, the gold staircases are astonishing and opulent. Palatial guestrooms are ordained with gold leaf and glass and enormous in size. Floor to ceiling windows offer endless views of the Gulf and a teasing bath and pillow menu ensure that any needs of the Burj’s refined guests are catered for. Dining at the Burj Al Arab makes for theatrical evenings as you embrace Dubai’s skyline from the SkyView Bar. Excellence in service is unparalleled at the Burj Al Arab. Spending time at the Library or at Talise Spa, every moment that is spent at the Burj Al Arab will be etched on your mind forever. Complimentary Upgrade – Complimentary upgrade to half board are available on applicable stays. Honeymoon Offer – Stay at least 4 nights for your honeymoon an save up to 15%. Boasting a fleet of Rolls Royce that is unimaginable, transfer services are available. Not wanting to travel by road, Helicopter transfers can also be arranged. Sahn Eddar – Afternoon tea is served beneath the World’s Tallest Atrium and surrounding dancing water fountains. Marina Garden – Sat open air with views of the Arabian Gulf and Jumeirah Beach Hotel, this is a lustrous location for cocktails or afternoon tea. Diwania Library – Whether playing snooker or finding reading material, each visit here is a longer stay than anticipated; the stunning views form the 18th floor are sublime. Outdoor Swimming Pool – Located on the ground floor and decorated with tall breezy palm trees, the outdoor pool is a wonderfully relaxing retreat. Private Beach – Sun beds are laid out on the soft white sands and beverages and light bites are brought to you as you lay back and listen to the sounds of the Sea. Wild Wadi Water Park – a 12 acre Arabian themed water park which is no end of fun-loving entertainment. For thrill seeking moments try the flumes or for a lazy day in the river, just float around the park. Sinbad’s Kids’ Club – Located on the 18th floor, activities are hosted to keep the younger Burj guests highly entertained. 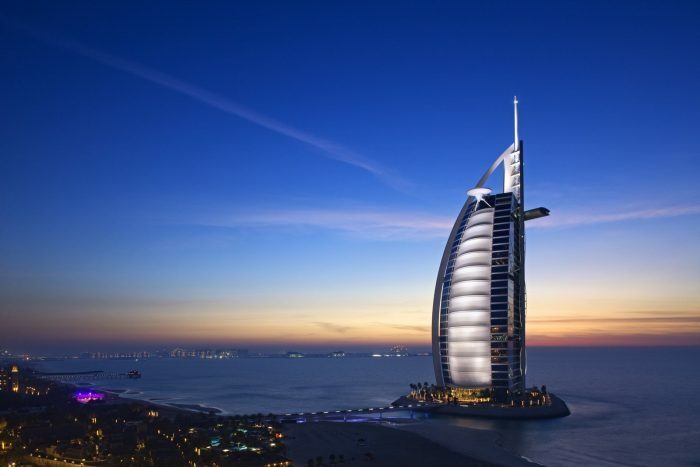 Burj Al Arab provides elitism, intimacy and elegance on its own private island. Architecturally magnificent Dubai is infamous for the Burj Al Arab and all its riches. Step into the exclusive hotel and be stunned by its riches and lavishness. Fireballs light up the drive and imperial fountain displays flourish the foyer; this no expense spared hotel bursts with spoils and riches. Abundant in cascading waterfalls and the world’s tallest atrium, the sleekness of this hotel is insurmountable. Guestrooms are vibrant in colour and rich in texture and immersed in gold leaf, and exquisite marble. Palatial living is prominent and each moment spent in your guestroom will make you feel like an Arabian King or Queen. Indulgent luxuries are plentiful and every need is fulfilled, in a heartbeat. Share intimate dining extravaganzas at the Burj Al Arab; taking a delicious culinary journey across the world. Home to three aquariums, guests will be mesmerised at the colourful fish and will have to stop each time they pass an Aquarium. Bathe in refined treatments at Talise Spa and experience blissful euphoria. Burj Al Arab is located on Jumeirah Beach Road, Dubai, U.A.E. Al Iwan – Arabic and international buffet is served at Al Iwan. Rich in flavour and full in body, each dish is sumptuous. Bab Al Yam – International cuisine is served in a serene setting with wonderful views, making leisurely dining a must.